I love craft beer but something has to be done to keep all those extra calories in check. Here’s a recipe for a delicious indulgence without the guilt. Here’s the recipe for how to make high protein peanut butter cups with ease. 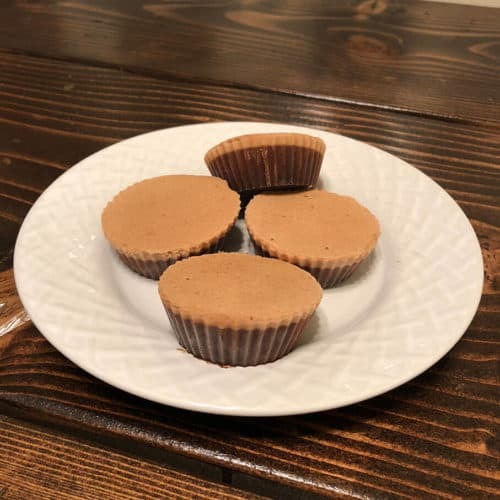 Making these high protein peanut butter cups is simple. It only requires 4 ingredients and takes less than 5 minutes. Combine ingredients in a blender and then mix on low setting until blended. Pour mixture into 12 silicon muffin/cupcake cups (these make the high protein peanut butter cups easy to remove once frozen). Freeze cups for at least 2 hours before removing from cups and enjoying! A standard 16oz carton of egg whites is enough to make 2 batches of these cups and they can be put in a large ziplock freezer bag for storage and stockpiling. Indulging in 4 high protein peanut butter cups is just 128 calories and 20g of protein! The perfect snack for after a workout or dessert. They’re low carb, Atkins, and Keto diet friendly. Great for weight lifters, body builders, dieters, and anyone looking for a delicious snack without the guilt. Enjoy!